Landscape ecology is a widely influential approach to looking at ecological function at the scale of landscapes, and accepting that human beings powerfully affect landscape pattern and function. It goes beyond investigation of pristine environments to consider ecological questions that are raised by patterns of farming, forestry, towns, and cities. 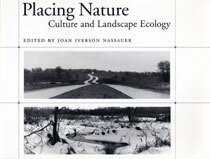 Placing Nature is a groundbreaking volume in the field of landscape ecology, the result of collaborative work among experts in ecology, philosophy, art, literature, geography, landscape architecture, and history. Contributors asked each other: What is our appropriate role in nature? How are assumptions of Western culture and ingrained traditions placed in a new context of ecological knowledge? In this book, they consider the goals and strategies needed to bring human-dominated landscapes into intentional relationships with nature, articulating widely varied approaches to the task. In the essays: novelist Jane Smiley, ecologist Eville Gorham, and historian Curt Meine each examine the urgent realities of fitting together ecological function and culture philosopher Marcia Eaton and landscape architect Joan Nassauer each suggest ways to use the culture of nature to bring ecological health into settled landscapes urban geographer Judith Martin and urban historian Sam Bass Warner, geographer and landscape architect Deborah Karasov, and ecologist William Romme each explore the dynamics of land development decisions for their landscape ecological effects artist Chris Faust's photographs juxtapose the crass and mundane details of land use with the poetic power of ecological pattern. Every possible future landscape is the embodiment of some human choice. Placing Nature provides important insight for those who make such choices -- ecologists, ecosystem managers, watershed managers, conservation biologists, land developers, designers, planners -- and for all who wish to promote the ecological health of their communities.